The Waterfront Partnership of Baltimore, Blue Water Baltimore, and EcoCheck have released the 2012 Healthy Harbor Report Card giving Baltimore Harbor a C- for water quality. A C- isn’t great, but some may be surprised that the grade was so high for the Harbor. The reported reason is that 2012 was a very dry year. Even though there was significant rainfall during Hurricane Sandy, the total rainfall for 2012 was only about 34 inches, 8 inches less than the average 42 inches of rain, according to NOAA. This meant that fewer pollutants were carried from hard surfaces throughout the watershed into the harbor. It also meant that the sewage system had fewer chances of overflowing or leaching due to infiltrated stormwater. So if the total rainfall in 2013 is closer to the average, the grade may go down when the next report card is released. 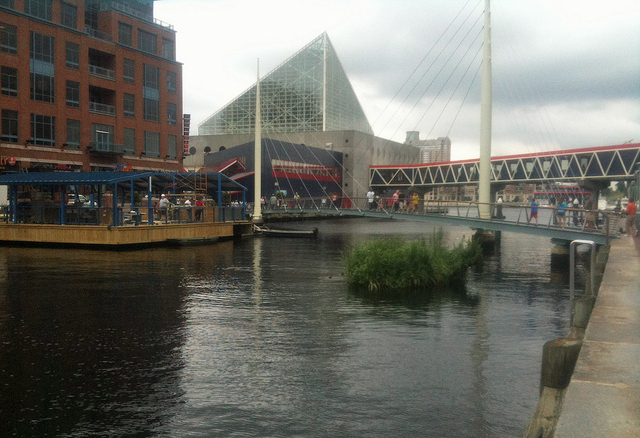 Baltimore’s Middle Branch and Mainstem Patapsco River each received a D+. Algae, dissolved oxygen, water clarity, and nutrients were the factors that went into the overall grades. These are the indicators of ecological health used by EcoCheck’s scientists to determine that the Harbor met their standards only 40% of the time. Trash and bacteria are also being tracked by the initiative. They are not factors in the overall grade, but they are important to humans who might use the water for recreation. Individual actions include efforts like the addition of rain gardens and rain barrels at home. Organizations around Baltimore organize trash cleanups, tree plantings, painting of storm drains, and educational programs in classrooms. Baltimore City government has increased street sweeping and will soon be starting a program called WatershedStat to track the conditions of water at stormwater outfalls. A Bag Bill – to charge shoppers for each plastic bag they use – and a Bottle Bill – to create a statewide bottle deposit – were attempted but not passed in 2012 but proponents will continue to push for this legislation in 2013. The main message from the Report Card is that the Harbor still has a long way to go before it becomes swimmable and fishable by the target year of 2020, but with the combined efforts of people and organizations who care, there is hope.